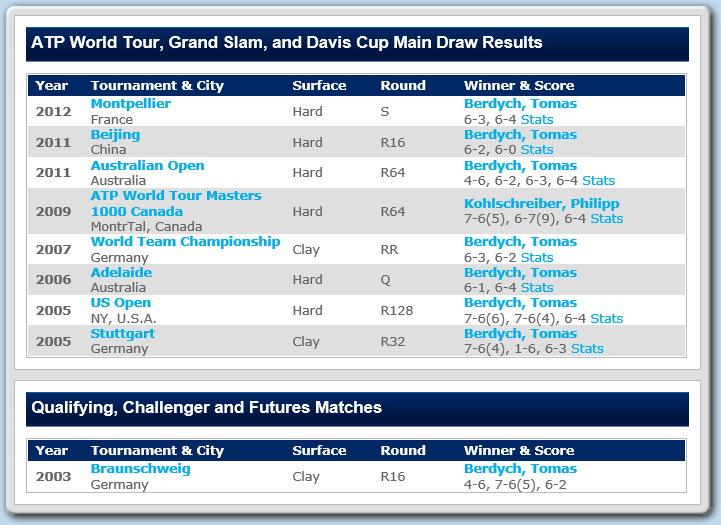 Tomas reached the semii-finals by beating Jo-Wilfried Tsonga in straight sets. 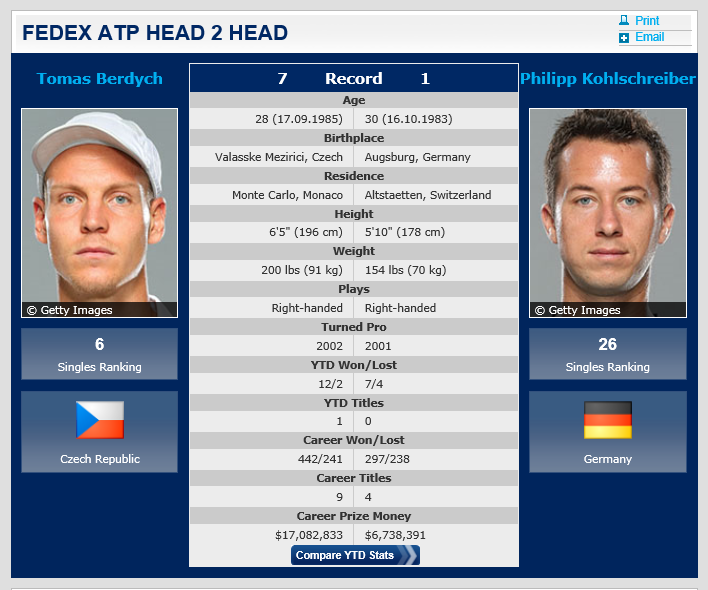 Today he will face German Philipp Kohlschreiber. The other semi-final will be played between Novak Djokovic and Roger Federer. Tomas Berdych will contest the final of the Dubai Duty Free Tennis Championships for the second year in a row after edging Philipp Kohlschreiber 7-5, 7-5 in Friday’s semi-finals. The Czech finished runner-up to Novak Djokovic in last year’s final and will look to go one better on Saturday when he faces Roger Federer for the title. Federer leads Berdych 11-6 in their FedEx ATP Head2Head series, but lost to the Czech in their last meeting, a year ago, in the Dubai semi-finals. Third seed Berdych extended his winning run to 11 matches unbeaten as he improved to an 8-1 FedEx ATP Head2Head record over Kohlschreiber. The Czech was on the brink of losing the first set as Kohlschreiber served at 5-4, but he recovered and clinched victory in 89 minutes. "It was definitely not me [at the start of the match], and it was a really horrible start to the game," said Berdych. "But I managed to refocus and stay there, stay calm, and wait for my chance, which I got in the end. I was ready for it, so I took the first set. "Philipp was serving really well [in the second set], very solid and didn't give me many chances at all on his serve. Then I got my one chance in the last game and I took it." The 28-year-old Berdych is coming off his ninth ATP World Tour title at the ABN AMRO World Tennis Tournament two weeks ago (d. Cilic) in Rotterdam and has a 16-2 record in 2014. The right-hander was also a semi-finalist at the Australian Open (l. to Wawrinka). “It was really tight and very close sets. The one moment I want to point, it was definitely the beginning of the match, which I probably forgot myself at the room and just came right after, and it was definitely not me, and it was really horrible start to the game,” Berdych admitted afterwards to explain his slow start. ‘I managed to refocus myself and stay there, stay calm, and wait for my chance, which in the end I got. Then I was ready for it, so I took the first set,” he explained.